a.) The only way to play it is via logging in a HP3000 mainframe via telnet. The authors were very canny about not releasing their source so it never has had a modern port. Having this sort of circumstance makes me paranoid the game will disappear forever so I’d like to play sooner rather than later. b.) Due to the long development time it is very large, with 49 treasures and 1216 points possible. I hence likely will be spreading it out amongst shorter 1979 games. c.) I have had people reach this blog searching for Warp specifically so there’s at least one person out there waiting for this one. So, random anonymous Internet person, here you go. Despite Warp being described as a “fantasy” above, it appears to be generally set in contemporary times. The objective seems to be to collect treasures about the world and put them in a “curator’s case” although I haven’t found any such case yet. You are standing in what appears to be the central plaza of a small seacoast resort. There is a large fountain in the center of this square, and the plaza extends quite a distance to both the north and south. You can see the ocean in the distance to the west, and to the east there is a large building on which there is a sign that reads “WARP BUILDING”. You’re standing in the lobby of the Warp Building. On the door to the north you read “MEN”; similarly, on the door to the south, “WOMEN”. There’s a security desk between you and the corridor to the east. The only other exit is to the west. Welcome to the women’s room. Looks a lot like the men’s room in many respects, except that there’s only one exit — to the north. A message carved into the wall says: “Call 333-2583”. The digital watch is the first treasure of the game. There’s a wandering mugger who will take your treasures and stash them in an alley, and a wandering policeman who will take your “weapons” and stash them … I’m not sure where, exactly. There’s a police station but I didn’t find anything there. “Weapons” seem to include the round peg and a banana. Someone could slip! You’ve floated right off the edige of the known world. All around you lie the remnants of past explorers and their vessels, coffins of worthless hulks. High above you, the waters of the ocean spill down from the world’s edge and splatter like grandiose raindrops all about you. You sense yourself leaving your physical body — A spiritual entity in a black haze. The bleakness begins to clear, however, and you begin to recognize familiar things, only everything appears in various shades of grey. This small cemetary appears to serve the City of Warp, but it does not have room to contain many graves. Small simple grave markers show the location of those in eternal sleep. A large fence prevents you from going east into a very deep ravine. Noteworthy is that even that you are *not* resurrected (“>DIAGNOSE” returns “You are dead.”) you can still wander around and look at things, although you can’t pick anything up. I don’t think I’ve hit another game with this feature before. In any case, there’s some interest in Warp past obscurity and massive size; it’s got some monster ambitions for the parser which includes an attempt to make it “smarter than Zork”. It has: backtracking (letting you type BACKTRACK 4 and retrace your last four rooms, for instance), macros (letting you define a set of actions as one command) and conditionals (“IF SEE THE BEAR THEN LOOK AT IT. GO NORTH”). I’ll explore these (and the rest of the game, of course) and report back next time. This is only a fraction of the overall map. There’s a lot of sameness to the rooms to enough an extent I normally associate with MUDs, not single player games. You’re in the middle of a long north-south street. To the west you can see the ocean in the distance, and to the east you can see a large building. You’re in the middle of a long north-south street. The ocean is in the distance to the west, and a large building can be seen to the east. You’re in the middle of a long street, extending primarily to the north and south, but also at this point there is a side street going to the east. The ocean is in the distance to the west. This is the famous West Bridge of Warp, known primarily for no reason at all other than the fact that Warp needed a bridge and this was a convenient place to put one. The road extends to the north and south, and there is a river below running east-west. You’re at a point where a north-south street meets an east-west street. To the south you can see what looks like a large park. I did manage to solve one puzzle (getting into the Warp Building by wearing a nametag) but otherwise my gameplay has consisted entirely of mapping. Unfortunately I’ve also had crashes. Remember I playing by logging into an HP3000 terminal and the experience is much flakier than I’d like; while I haven’t built up a game yet and am simply in the gathering info phase, if I want to be serious about attempting a win I need to work out how to get a little more stability. I haven’t played with the new parser features much other than to try a macro. Round. Made of wood. Not very big. The command above reroutes the command “X” which is normally unrecognized into “LOOK”. One last random observation before I sign off: I’m finding the “reject a command” response grating. This is part of the lush grounds of Warp Park. >FLAP FLAP FLAP< I think it's hopeless. "Shake" is Danish to me. Try English. This is made worse by the existence of a nearby tree that you can climb (by going up). I know authors sometimes try to be colorful in their error messages, but it is highly unlikely the reason a player’s command is unrecognized is a lack of being in English. It’s like the game is expecting the player to apologize and not the game itself. I have been occasionally hacking at Warp but I am still mainly just adding rooms to my map and don’t have anything interesting to comment on yet (other than it is ludicrously easy to die — my favorite was entering a desert and having a rock fall on my head out of the sky). I did hit one puzzle that might be self-contained enough I can send it to you, the readers. Or possibly we’ve got a red herring here. I’m in the Warp Museum (which has the display case you need to put found treasures in, hurrah) and just next to the display case room there’s a room with a stone disc that has a green, red, blue emeralds embedded within. All three count as treasures (and the stone disc is too large to move) so they must be extractable somehow. There’s an inscription on the stone disc. It might be a cryptogram. If not, then there’s likely some item that will clarify that I haven’t found. Either way, I’m curious what all of you can do with this. ADD: Definitely a cryptogram. I have rejiggered letters to put it in more traditional form if anyone else wants to have a go. I solved it with this website which is not an autosolver but lets you easily make substitutions and have them automatically carry to all letters. Also, thanks to Tjeerd who has the solution in the comments. There are two ways to look for creative innovation. The conventional way is to look at recent efforts in a field (see, for example, Emily Short’s post Experimentation in the Parser Domain). The paradoxical way is to look at older work. Many times a work’s innovation is lost because the work itself is obscure or the implementation of a promising concept was badly done. Often you can find the future in the past. This seemed neat, but I had trouble making it work until I tried to ride a bus. The bus moves about the map at three stops travelling back and forth, and if you want to get on the bus it sometimes takes a long wait. Several times I accidentally waited past the bus arriving. I made a macro. Now every time I type “X”, the game will first check there is a bus. If so it will ride the bus (in needs to be in that exact syntax; for all the advanced tricks the parser can do it misses some obvious synonyms). If not then it takes inventory to wait a turn. (While WAIT is an actual command it causes a real-time delay.) The game still takes inventory when successfully getting on the bus, but it doesn’t cause an issue with timing. The roar of an engine and squealing tires can be heard up the street. pulls to a stop before you and its doors open with a loud hiss. There is a large bus here that looks like it’s getting ready to leave. You wave your bus pass and the bus driver smiles as you climb aboard the bus. The bus rattles somewhat as it carries you ahead. Now I can just rattle of Xs until the bus arrives and the player character hops on automatically as opposed to spamming just a wait command and missing the bus altogether. IF NOT SEE THE BUS THEN I. IF SEE THE BUS THEN RIDE BUS. This way there’s not the extra turn taken after riding the bus. This required a bit of a programmer’s sensibility; the player won’t see the “bus object” after getting on the bus, meaning if the statements are in reverse order the NOT SEE statement will still trigger after boarding the bus. This is so convoluted it only seems thematically appropriate in a “robot character” game like Dan Shiovitz’s Bad Machine or Paul O’Brian’s LASH. 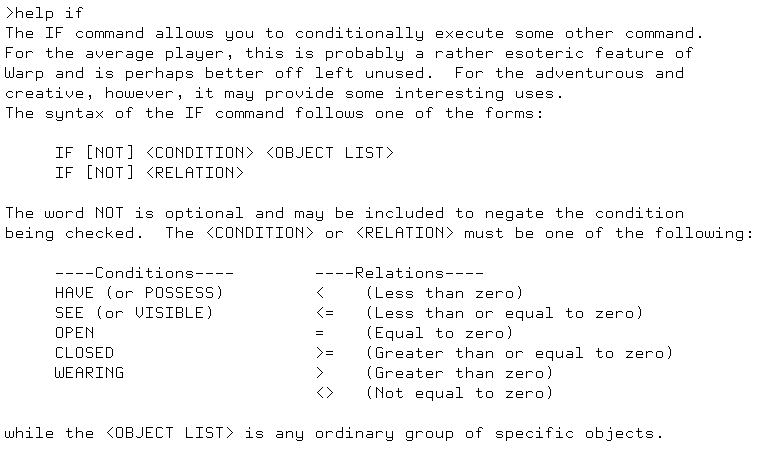 I’m not convinced the “IF” command is that helpful in more standard text adventure games. My last update promised I would get to the mainframe game Lugi soon, but in the process of trying to set it up I made a new discovery regarding Warp. Brief reminder: Warp is a gigantic mainframe game with 1216 points possible on the HP3000. It has an unusual parser that allowed “conditional” statements and macros. The only way I had of playing it was via a telnet server, so I was paranoid it would eventually disappear forever. In May of last year, a genuine expert at the HP3000 (Big Dan the Blogging Man) made a “packaged” version of the HP3000. If you’ve tried the Digital Antiquarian’s TOPS-10 in a Box, this is similar: you just download and run. which is the games account, and then you can RUN WARP to play Warp offline! Bill Wolpert’s Mystery Mansion from 1978 is on there too (RUN MANSION) so you can emulate it running on the original hardware rather than using a port. To quit, press CTRL-A to enter console mode, then type SHUTDOWN. 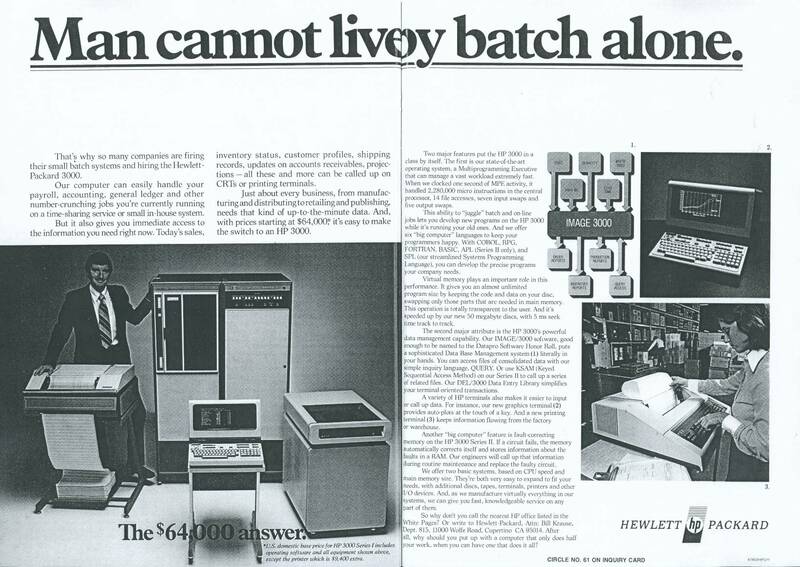 From a 1978 ad for the HP3000.